Omega-3 fatty acids have been a staple of dry eye practice, and many ophthalmologists and optometrists have seen improvements in patients taking them. Now, the DREAM study has seemed to call the use of omega-3 fatty acids—from fish oil at least—into question. The DREAM study was an ambitious project, and I congratulate everyone involved. We needed this study. And just as good science does, it generates even more good questions. Should we still use omega-3 fatty acids to treat dry eye? And if so, which ones? Are we measuring the right things in our dry eye patients? Are there omega-3 fatty acids besides those tested in DREAM that might still be worth considering? Every practitioner will need to reflect on the research and come up with his or her own answers—but as someone who lives and breathes dry eye, here is my take. Despite decades of study demonstrating the clinical value of omega-3 fatty acids, it is not without debate. The recently published DREAM study¹ yielded some surprises. This large National Eye Institute-sponsored study found that fish oil did not perform significantly better than the olive oil placebo in treating dry eye. There were some sources of confusion about the study, as well as drawbacks. First, the study included a wide slice of the dry eye population, with relatively few exclusions, and the study allowed users to change treatments over time. This was an innovative approach intended to reflect real clinical practice in a variety of patient subtypes on various treatments. Both the treatment and placebo groups improved over the study timeline. Given the heterogeneity of the study population with an inherently complex and multifactorial disease state, measuring the effect of a single, non-specific intervention is about as easy as listening to a single conversation at a noisy social gathering from across the room. Second, the traditional measurements used (like OSDI and Schirmers) have limited sensitivity and specificity. We are limited by the measuring sticks we currently have. If we don’t get the results we expect, are we looking at a treatment that doesn’t work, or are we just not using the right measuring stick? As a stand-alone study and also in the context of a multitude of omega studies, the DREAM study has a lot to teach us. Perhaps we shouldn’t lump dry eye together into a few types. Perhaps dry eye is actually a dozen different subtypes. We do need better tests that more precisely categorize patient subtypes, rule out comorbidities and masqueraders, as well as measure disease state activity in response to therapies. We learn as much from what didn’t work as from what did. 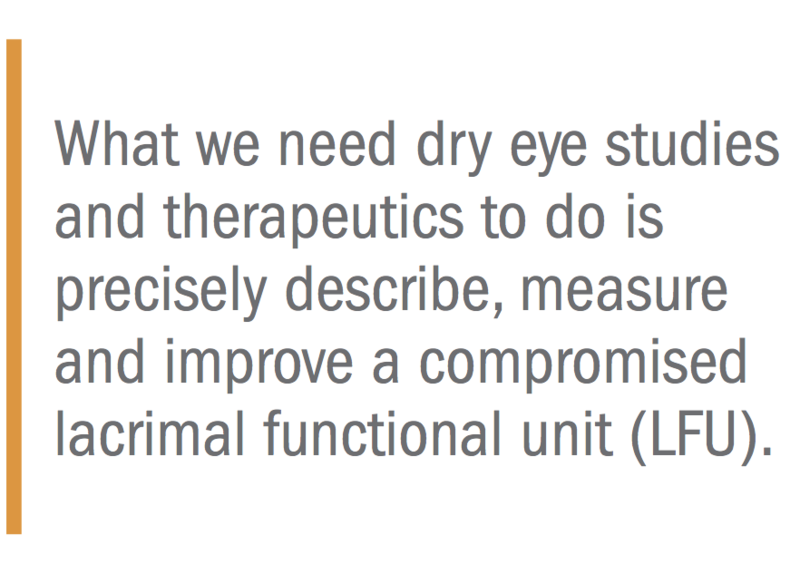 What we need dry eye studies and therapeutics to do is precisely describe, measure and improve a compromised lacrimal functional unit (LFU). A compromised LFU is like a mountain river ecosystem where the slope, flow, erosion control, water quality, flora, and fauna have somehow lost the ecosystem’s homeostatic harmony. It is important to acknowledge that the findings of DREAM don’t apply to all omegas. Omega-3 and 6 fatty acids play an integral role in the body’s ability to regulate and balance inflammation. I still remember the first study I read showing that omega-6 supplementation was helpful in Sjogren’s syndrome patients and being shocked by information that was contradictory to what I thought I knew. This started my journey into studying and more deeply understanding the biochemistry of both omega-3s and omega-6s. Many inflammatory cytokines (both pro-inflammatory and anti-inflammatory) are produced from omega fatty acid building blocks. The mechanism of action of NSAIDs relies on targeting the metabolism of the pro-inflammatory omega arachidonic acid. Arachidonic acid is a largely pro-inflammatory omega-6 metabolite that is over-abundant in the Western diet and is the reason omega-6s have a bad name. But, as with most things in biologic systems, there is balance and nuance and more to the story. PGE1 is found in the tears, the lacrimal glands and the conjunctiva. Also, GLA has been shown to increase PGE1 levels and increase tear production in Sjögren’s syndrome.4 Connecting these dots clarified my surprise at the Sjögren’s paper years ago. It has been shown that when GLA is combined with the proper balance of eicosapentaenoic (EPA) one can inhibit production of arachidonic acid5 while stimulating production of anti-inflammatory cytokines from both GLA and EPA. EPA inhibits delta 5 desaturase, the enzyme required to convert omega-6s into arachidonic acid.6 If you block that enzyme, you divert the metabolic traffic flow down to one lane towards the desirable anti-inflammatory PGE1 pathway. Nutrition matters—you literally are what you eat. If we have the ability to repair the foundation, then nutrition and nutraceutical therapy are my starting point, not merely an adjunct. 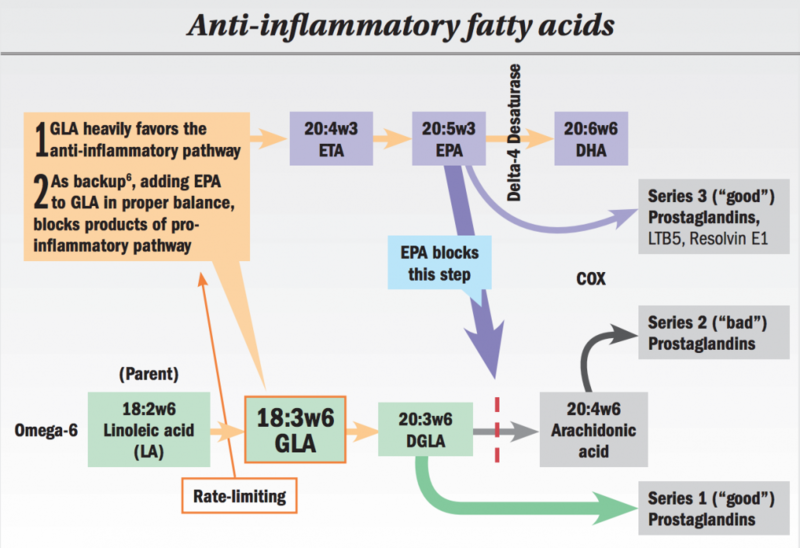 Dietary access to the anti-inflammatory omega6, GLA, is very limited. GLA is found in just a few plant-based oils that are not readily available in the typical American diet. The omega-3s, EPA and DHA, are obtained primarily from fish oils. Since our bodies cannot produce GLA, EPA or DHA directly, and since creating them through metabolism is inefficient (especially with age), we need to look to nutritional supplementation. The level 1 dry eye patient tends to respond well to environmental, lifestyle and nutritional interventions. A randomized, controlled, double-blind study demonstrated that a supplement containing GLA along with EPA and DHA in dry eye patients significantly improved symptoms, suppressed markers of conjunctival inflammation, and maintained corneal smoothness in post-menopausal women.7 I have personally seen excellent clinical and MMP9 improvements in early Level 2 patients who took the nutritional supplement HydroEye (Science Based Health) as a solo agent (patients who got too busy to start the other recommended therapies). With Level 2 patients, I build upon foundational nutrition therapy by layering on immunomodulators such as cyclopsorine or lifitegrast and new neurostimulation approaches. When taking the nutritional approach with patients (eg. Whole30 diet), I also recommend only high-quality, pure, science-backed nutraceutical formulas. The DREAM study gave us much to consider and we will continue to improve our understanding of dry eye together. Taking a big picture approach that also considers other excellent omega science, we find evidence for the benefits of balanced omega-3 and omega-6. Taking every opportunity to understand more, think deeper, and observe more carefully allows us to embrace the opportunity that science affords us. Macri A, Giuffrida S, Amico V, Lester M, Traverso CE. Effect of linoleic acid and gamma-linolenic acid on tear production, tear clearance and on the ocular surface after photorefractive keratectomy. Graefes Arch Clin Exp Ophthalmol. 2003;241:561-566. Kokke KH, et al. Oral omega-6 essential fatty acid treatment in contact lens associated dry eye. Contact Lens and Anterior Eye. 2008;31:141-146. Aragona P, Bucolo C, Spinella R, et al. Systemic Omega-6 essential fatty acid treatment and PGE1 tear content in Sjogren’s syndrome patients. Investigative Ophthalmology and Visual Science. 2005;46:4474- 4479. Viau S, Maire MA, Bruno P, Joffre C. Eficacy of a 2-month diatary supplementation with polyunsaturated fatty acids in dry eye induced by scopolamine in a rat model. Graefes Archive of Ophthalmology. 2009;247:1039-1050. Barham JB, et al. Addition of EPA to GLAsupplemented diets prevents serum arachidonic acid accumulation in humans. J Nutr. 2000;30:1925-1931. Sheppard, JD, Singh R, McClellan A, et al. Longterm supplementation with n-6 and n-3 PUFAs improves moderate-to-severe keratoconjunctivitis sicca. Cornea. 2013;32:1297–1304. doi: 10.1097/ ICO.0b013e318299549c.